Need an outdoor adventure? Spring is here and that means warmer weather. So if you are looking for a workout or just a scenic view, the Aurora, Illinois area has a trail that is sure to suit your needs. 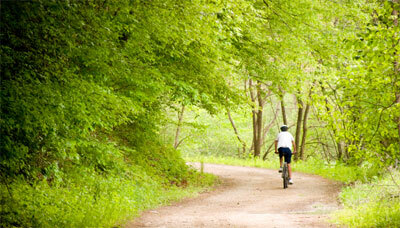 Bicyclists, walkers, runners, horseback riders and bird watchers are all welcome! So get outside and hit the trails! After spending a long day outside, stay the night at the Hampton Inn & Suites Aurora, located just off I-88. This is the ideal place to stay for those visiting one of Illinois' beautiful trails. Discover 36 miles of outdoor adventure in Northern Illinois! Used for hiking, biking, cross-country skiing and jogging, the Fox River Trail, changing surfaces from concrete to asphalt to crushed stone, stretches from Algonquin to Aurora. Travel through nature preserves and quaint towns along Illinois scenic Fox River. North America's first successful rails-to-trails conversion, the Illinois Prairie Path is a multi-use nature trail for non-motorized public use. It spans approximately 61 miles in Cook, DuPage and Kane Counties in northeasten Illinois. This trail is 14 miles of an abandoned railway from St. Charles to the DeKalb County Line. Made of limestone, it is a smooth surface for runners and bicyclists. The trail also includes a natural surface, mowed grass path for horseback riding. This nature trail begins at Rt. 30 near Montgomery Road and stretches west, a distance of approximately 11.2 miles to Waubonsee Community College. It serves as a scenic route for hosting 5K runs, walk-a-thons, bike races and more. Restored to native prairie, this preserve stretches along the Blackberry Creek. Hawks and many other birds are commonly spotted as you walk 2 miles on this multi-use trail alongside a scenic stream.